This year the Oge Creative Group invited me to create some of the playing cards for their installation “House of cards”, during the Amsterdam light festival. 27/11/2014-18/01/2015. House of Cards – Amsterdam (making of) from OGE on Vimeo. Will it blow away or continue to rise up towards the heavens? The fate of the card house wobbles between the two. Up or down. According to OGE Creative Group – a design studio from Israel that specializes in architecture, art projects and light design in the public space – it’s far from decided. Their design, an almost six-meter-high tower of gigantic playing cards, remains in a never-ending state of limbo. House of Cards (no, not a reference to the popular Netflix series about corruption and envy in the US Congress) is fragile and secure at the same time. You hold your breath when a storm blows through, but when up close, you can see how sturdy and ingenious the structure actually is. Just like Amsterdam, actually, a large city built on poles. These poles haven’t collapsed although it has, truth be told, been quite suspenseful in the past. House of Cards consists of 128 light boxes in the form of playing cards, which in turn (or all at once) appear according to a preconfigured choreography. The ingenious structure has several levels; it looks like a modern church from one side and from the other like a classical structure of building blocks. The idea, so the authors, stemmed from childhood memories and playing with their own children. Notably playing cards once had a great popularity throughout the globe and different cultures. Also in the Netherlands, one can still find the creations of the Speelkaartenfabriek “Nederland” (NSF), or ‘Playing Cards Factory Netherlands’, a famous printing house once located on Amsterdam’s Prinseneiland, not far from Amsterdam Central Station. As homage to this culture and history, the House of Cards installation is placed not far from the historical location. Every card of House of Cards has a different design. For this Gaston and Merav from OGE have invited 40 friends and internationally acclaimed street and visual artists from all over the world, people who have a special relationship with the city and regard its walls and streets as a canvas upon which to present their work. 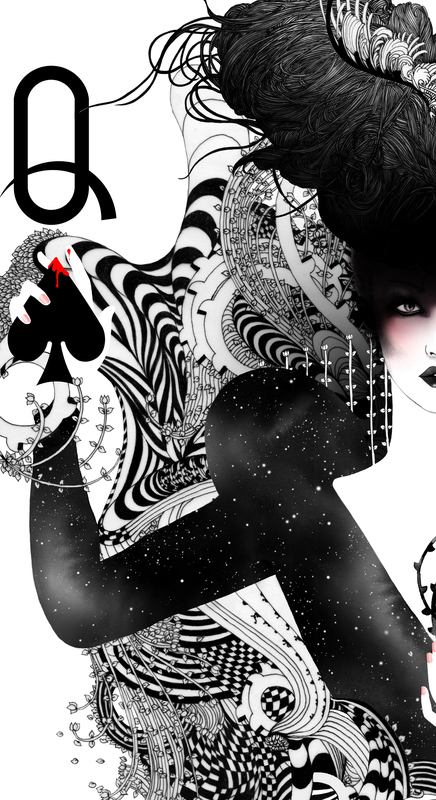 The result is a stunning new deck of cards that is premiered in Amsterdam. Visitors are invited to walk around the installation and discover fantastic artworks of famous artists such as: 281 Anti Nuke (JP), Alexandros Vasmoulakis (GR), Armando Mesías (COL), Brent Eastabrook (AU), Caia Koopman (US), Connie Lim (UK), Dali Roll (KR), FinDAC (UK), Floksy (RU), Françoise Nielly (FR), Gaston Zahr (DE/IL), Herakut (DE), Kazuhiko Nakamura (JP), Laguna (ES), Laura Laine (FI), Lital Gold (IL/US), Loretta Lizzio (AU), Marthalicia Matarrita (US), Merav Eitan (IL), Minjae Lee (KR), Monica Sutrisna (AU), Naoto Hattori (JP), Nicoletta Ceccoli (IT), Noumeda Carbone (IT), Paris Koutsikos (GR), Patrice Murciano (FR), Pau Turrona Quintanajornet (CL/DE), Priscilla Ainhoa Griscti (MT), Ryan Roth (UK), Ryohei Hase (JP), Ser (GR), Shingo Matsunuma (JP), Signer (IL), Simoni Fontana (GR), Skount (ES/NL), Suiko1 (JP), Vraziotis (GR), Wesr (PE), Yu Fordy Fu (FR), Yuki Matsumura (JP) and Zed1 (IT). House of Cards, therefore, portrays the city in various ways. It has literally been built up like a city or a large building, layer by layer, until taking the form of a house. The card house also refers to a less tangible but equally important structure in society – a structure that is built by people and their relationships. We may desire to put our own interests first, but at the end of the day, we should expect (or rather, hope) that we all pursue a common goal: the creation of a safe, enjoyable and creative environment. It’s a subtle and fragile network. If someone pulls a card from the deck, or starts to saw at one of the wooden poles, it’s up to the rest of the structure to absorb the blow and remain upright. We’re not there yet. For now, House of Cards remains standing, shining in the night. The members of OGE Creative Group prefer to work on their lighting design projects during the night hours as they consider it to be the most appropriate time of the day to realize their dreams and wishes. During one of these evening creative sessions, the idea for House of Cards was born, the illuminated card house that, for now, reaches for the stars.